Michael Pollan begins his book with a seemingly simple question, “What should we have for dinner?”. We soon discover the path towards an answer to be more indirect and complex than would first appear. Pollan delves into the simple premise of ‘you are what you eat’, and unearths some illuminating and at times chilling truths. Born from a desire to find out how the once simple act of eating has become so complicated and overwrought with anxiety, The Omnivore’s Dilemma is his attempt to if not cure a nation’s eating disorder, then at least shed some light to the situation. The Omnivore’s Dilemma is about the three principal food chains that sustain us today: the industrial, the organic, and the hunter-gather. And, according to Pollan, “These three food chains link us, through what we eat, to the fertility of the earth and the energy of the sun.” And so, “ the best way to answer the questions w face about what to eat was to go back to the very beginning, to follow the food chains that sustain us, all the way from the earth to the plate – to a small number of actual meals.” Pollan takes his theory to the fundamentals and applies it to personal experiences, his meals. Divided into three sections, the first ‘Industrial’ discusses the industrial food chain focusing primarily on corn ; the second, ‘Pastoral’ is a look at organic food, (from supermarket and big business to rural farms); and the third, Personal is about the forager food chain; hunting, gathering and growing one’s sustenance. Each section culminates in a meal—typical McDonald’s fast food fare; an organic meal of roast chicken, vegetables and a salad from Whole Foods supermarket; as well as, a meal made from the fixings from a sustainable farm; and, lastly a dinner prepared entirely from ingredients he hunted, gathered and grew himself. He aims high in his search for the perfect meal and it is here is where I find him to be most engaging. An admitted neophyte hunter and reluctant fungi forager, Pollan manages to pull together a menu comprised of braised wild pig; wild yeast levain; dried morels with fava beans; local garden salad and a cherry galette. 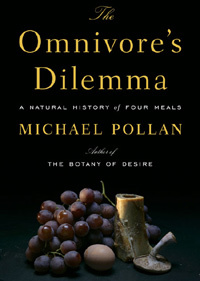 Written in a clear and engaging voice, The Omnivore’s Dilemma is an enjoyable and informative read that appeals to anyone with even a remote interest in what they eat. That in itself would make it a highly recommended read, the fact that it has fuelled a genuine awakening and active debate in a nation’s food crisis make it an important and ‘must read’ book.